While I’m not quite there yet with the whole nudist thing, or the raw foodist thing, I’m certainly partial to an excellent salad or refreshing raw soup. Aside from the fact that raw meals are generally delicious, it’s commonly accepted that most vegetables and fruits are best for you when they’re not cooked. This isn’t always what you might prefer, given the usual preference for hot food on cold days, but as the weather warms up I suggest that you give it a shot. You probably already eat a fair amount of raw food anyway, but just don’t think of it that way. Fruits, salads, smoothies – they’re mostly raw right? If you want to have a raw ‘meal’ just increase the amount of raw things until there’s no room on the plate for cooked things! Easy! Otherwise you can try specifically ‘raw food’ recipes, the internet is full of them, and I think my soup recipe below qualifies. In neither of these recipes did I use 100% raw ingredients, because I take a fairly relaxed approach to the whole thing. But both capture the essence of what I think raw eating is all about – fresh, flavoursome, healthy food that is both satisfying and nourishing while being very close to its natural state. 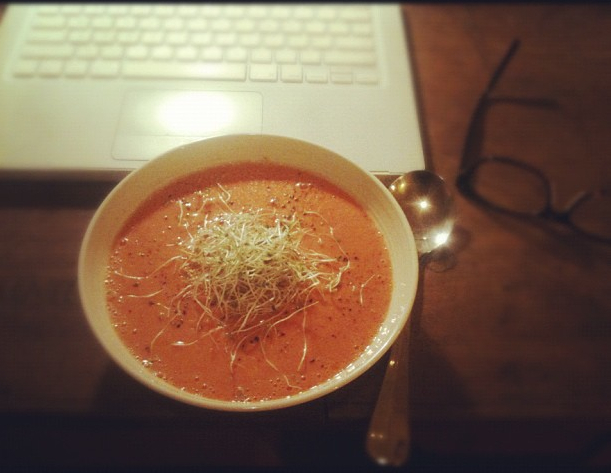 I first made this soup for myself as dinner while I studied for my mid-semester exam the other week. I’d been looking for a raw soup recipe that didn’t call for a copious amount of fat – most of the raw soup recipes I’ve found either have avocado, oil or nuts in large proportions. That’s fine and all, but not when I felt like a light dinner. I didn’t have much luck so this was an amalgamation of a couple of recipes, a bit of an experiment. I loved it. I loved it so much that I made it last weekend for lunch and poured a bowl of it for Ash. He enjoyed it too, but suggested that it would be better served in a small bowl as an entree rather than as the main course. I’m ok with that. I still liked it as a main, but then I’m a bit of a weirdo when it comes to food. Maybe try it as an entree and see what you think, it’s always easy to make more next time. Then there’s this salad, the one I’m sharing with you today. It’s all about the dressing I made up a few weeks ago. It’s my new go-to dressing. It’s sweet and salty and not overpowering, but very complimentary to all things fresh and crunchy. 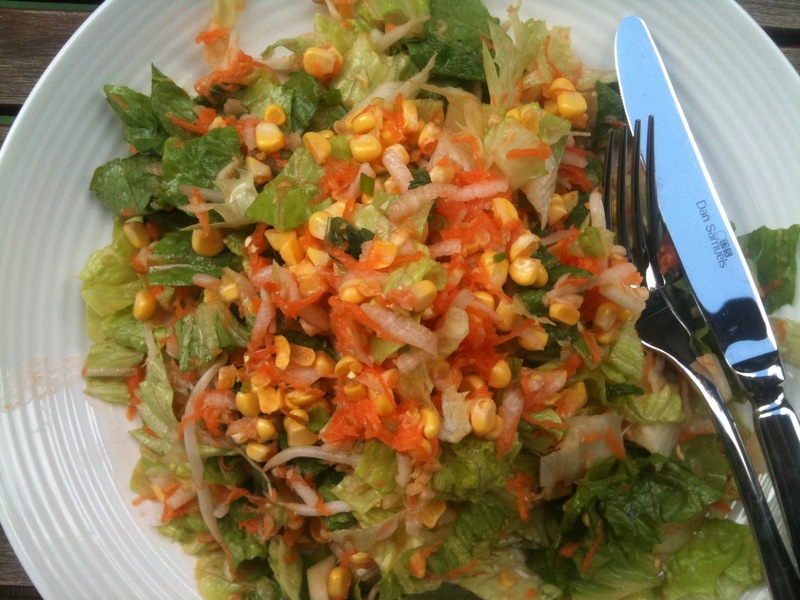 I paired it with the light flavours of shredded romaine lettuce, white radish, grated carrot, raw corn and mint. I’ve also made it with a mix of pineapple, mint, snowpeas, chinese cabbage, bean sprouts and alfalfa which was equally delicious. Mix and match baby. Toss dressing with salad ingredients and serve. Blend fresh and sundried tomatoes, almond milk, salt and lemon juice until smooth and creamy. Serve topped with cracked pepper, sprouts and/or seeds.